Karuizawa Asama Kougen Premium Clear is a 5.5% German pilsner that is deemed to be a premium beer by Karuizawa Brewery and as a result, is sold at a premium price of over ¥500 a bottle. Thankfully, there is a canned version available, but BeerTengoku is yet to see it in the wild, unlike the cheaper versions of Karuizawa Asama Kougen Black or Weiss. Karuizawa really need to come up with some snappier names for their beers. Karuizawa Asama Kougen Premium Clear pours out without much head and a golden amber colour that is darker than most lagers. There really is not much to write about here when it comes to the aroma. Some subtle notes of fruit and a very mild hop smell but then that could have been from my wife’s beer at the time. Thankfully the taste of Karuizawa Asama Kougen Premium Clear is ever so slighlty stronger than the aroma. Just. Slight maltiness to it that is followed up with some sweetness and just a little bit of bitterness in the aftertaste lets me know that I have drunk a beer. 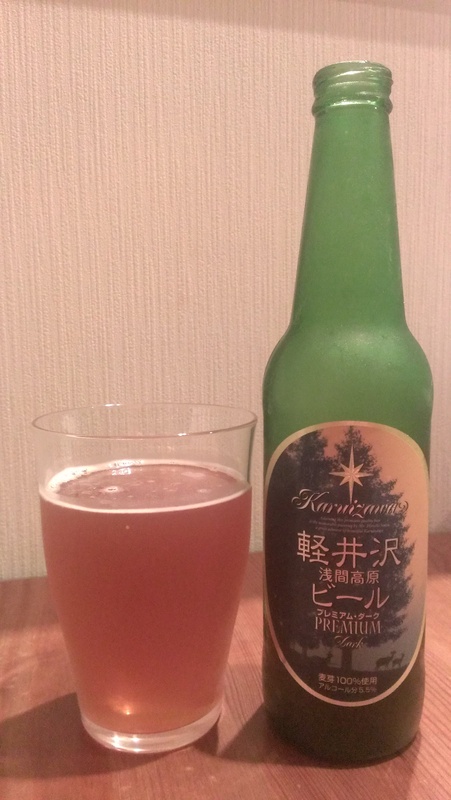 Karuizawa Asama Kougen Premium Clear tastes what Budweiser would do if someone added some sugar, and is simply not worth the money. My local Seiyu sells Budweiser which is cheaper than this so go pick up some of that. If you are desperate to spend your money then Karuizawa Asama Kougen Premium Clear can be bought in these places here (Japanese only). I agree. I have tried several of these beers, and was disappointed. They taste like any other industrial beer, so why do they cost twice as much? I’m guessing due to tax laws, Karuizawa Brewery have to increase the price to compensate for the high amount of tax, at about 240yen per litre or so. Due to the volume they sell, compared to say Kirin or Asahi, it means their prices are much higher. Well, that’s what I’m guessing. I like their cans of ‘Dark’, which are much cheaper and fairly flavorful. Agree with you though, Not sure the point of this ‘Clear’ premium bottle.